This week I have been feeling beyond lethargic, my energy levels are hurting and that never plays out well for me. Feeling over it and craving some change I am going to do a weekend juice cleanse. Now I am sure some of you are going to turn your nose up or disagree with my choice, but it’s something I have plenty of experience with and have come to crave every once in a while. Room in your freezer – if you find you freezer is packed this may be a good time to take some time to purge some freezer burnt or unhealthy items that you don’t need. It’s for the best I promise. A blender or a juicer- Personally I blend all my juices, but if you don’t want to, or have access to a juicer by all means juice away! I find I enjoy having the extra pulp and its an easy way for me to sneak in some extra fiber. not only that but it keeps me full longer. Often there is confusion over juices and smoothies. When it comes to these recipes you can use either a juicer or a blender to create more of a “smoothie” effect. You will have more fiber and extra water (which you will be adding separately). 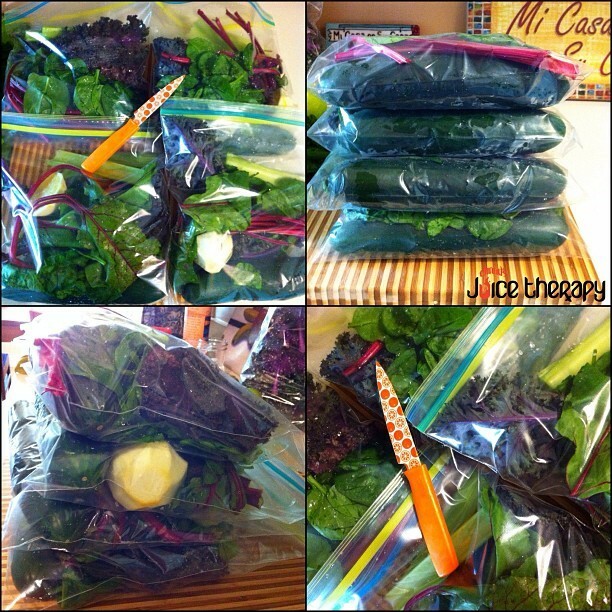 When using a juicer you are cold pressing your ingredients, essentially squeezing out the moisture and liquids. Either way your getting a ton of good stuff, if you can stomach the pulp, I recommend it. I find it much more beneficial, an easier clean up, and quicker. Here is where you can get creative. Get excited for what your mornings are going to have in store for you from now on. Fruit is next, this for me is ALWAYS bananas, whole kiwis, and then whatever else I am in the mood for. This usually means pineapple, apples, and some strawberries. I find its hard to find reasonably priced fruit this time of year so I like to stock up in the summer and freeze it all. This way I can just portion it out into my bags and pop it right back in the freezer. Pretty much anyway you mix it these are going to be delish-as long as you don’t over do it on the greens before you’re ready. Start small and build up adding more and more. Otherwise you might turn yourself off the taste. Check out our PINTEREST, I made a board just for you guys for all sorts of different juices, cleanse and information on the benefits of juicing. And for those who are interested in doing a cleanse I have printed out DR.OZ`S WEEKEND CLEANSE you can pick up down stairs by the charging station. We also have a nutrition team on staff if you have specific questions about doing a juice cleanse. Have a quick 20 minute consultation or get a customized nutrition program. Learn more about what we offer here.